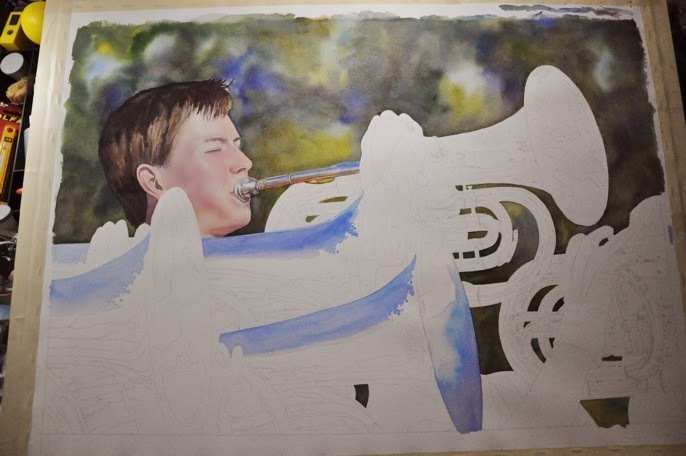 I haven't had a whole lot of time to work on my baritone watercolor, which I have decided to title "Fanfare". However, I did get a chance to add hair to my sons head and I started the metal of the marching baritone that he is playing. I also started adding some of the blue to the horns where the sky is reflecting on the tops and bells of some of the horns. In the close up you may be able to see the variety of grays and color that are in the metal including some great orange reflections that are from the marchers orange-ish shirts. The painting is mostly a cool color scheme and so the warmer oranges in the skin and reflections will be a nice contrast. Now that I have some of the surrounding values in, the face looks a little pale. I will probably add a few more thin glazes of color to his face before the painting is completed. It is always amazing to see how the early values change as other values are placed next to them. I will keep posting updates as the painting progresses, so please check back. I was wondering if you were still working on this painting...good to see your progress...know it will be a great painting once you're finished. You are right about the value shifts...adding another or a darker tone can change the whole painting. Thanks for following along Johanna and for your great comments!